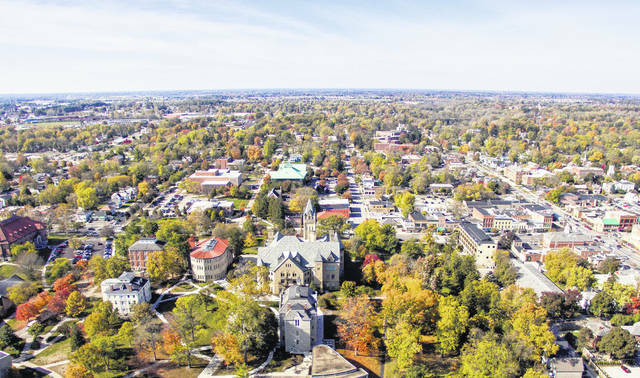 Pictured is an aerial look at the Ohio Wesleyan University campus and a portion of downtown Delaware. On Monday, the city and county both agreed to enter into a three-party agreement with OWU for the creation of the Delaware Entrepreneurial Center, which is expected to open in August at 70 S. Sandusky St., Delaware. Ohio Wesleyan University, Delaware County, and the City of Delaware are joining together to create The Delaware Entrepreneurial Center, a business incubator and education center to be located on the OWU campus. “This is a forward-looking commitment that positions Ohio Wesleyan and Delaware for leadership in the middle of the 21st century,” Jones said, noting the center is thought to be the first-of-its-kind liberal arts incubator and first-of-its-kind city, county, and educational institute partnership. The Delaware Entrepreneurial Center will be housed at 70 S. Sandusky St. – Ohio Wesleyan’s current Stewart Annex – and include rentable office spaces, a shared work area, a conference center with digital meeting capabilities, and educational programming to support entrepreneurial understanding and success. Ohio Wesleyan students will have opportunities to complete internships with center users, providing potential assistance with research, marketing, and budgeting while gaining valuable hands-on experience. The center is expected to open before OWU’s fall classes begin in August. Learn more at www.owu.edu/delaware-entrepreneurial-center. The university will oversee renovation of the 6,000-square-foot center and provide in-kind services to operate and maintain the two-story building and surrounding property. Ohio Wesleyan’s Woltemade Center for Economics, Business and Entrepreneurship will contribute $100,000 toward the renovation and have an office inside the building. The city and county also are supporting the entrepreneurial center, with each agreeing Monday to commit $50,000 to the venture for each of the next five years. Both entities will have access to office space inside the center to assist budding businesses as they mature and seek to move to independent locations. The Delaware Entrepreneurial Center will be governed by a seven-member advisory board consisting of representatives from the university, city, county, and local entrepreneurial community. The Ohio Wesleyan campus is an ideal location for the center, Jones said, as the university has been recognized by Forbes magazine as No. 1 in Ohio and No. 17 in the United States among “America’s Most Entrepreneurial Colleges.” In addition, Ohio Wesleyan’s new business administration major was its most popular declared major among the fall’s incoming freshmen. The City of Delaware also is an ideal location, Homan said, having been ranked recently by PennyHoarder.com and Money Magazine as one of America’s best small cities based on such factors as economic health, affordability, quality of life, safety, education and health. In addition, Benton said, SmartAssets.com named Delaware County as Ohio’s No. 1 county for incoming investments in business, real estate, government, and the local economy in 2017. Learn more about Ohio Wesleyan’s business- and economics-related majors at www.owu.edu/economics, more about Delaware County’s economic development office at www.delawarecountyecondev.com, and more about the City of Delaware’s economic development office at www.delawaremeansbusiness.com.